Source: CICH graphic using data adapted from Statistics Canada – 2011 National Household Survey. Catalogue Number 99-014-X2011033. http://www12.statcan.gc.ca/nhs-enm/2011/dp-pd/dt-td/Rp-eng.cfm?LANG=E&APATH=3&DETAIL=0&DIM=0&FL=A&FREE=0&GC=0&GID=0&GK=0&GRP=1&PID=107004&PRID=0&PTYPE=105277&S=0&SHOWALL=0&SUB=0&Temporal=2013&THEME=98&VID=0&VNAMEE=&VNAMEF=– accessed March 19, 2017. 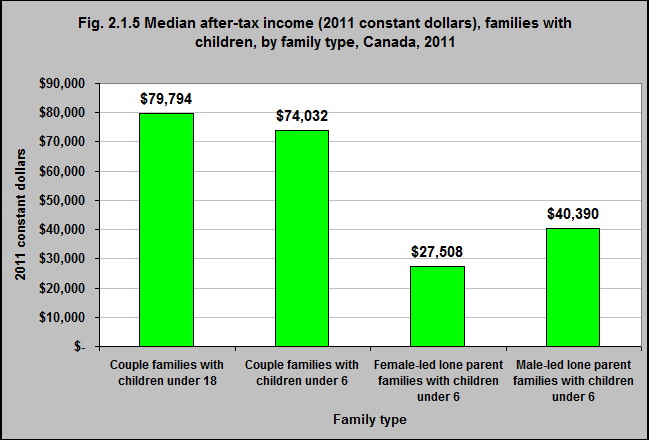 The median after-tax income* for all Canadian Couple Families with children under 18 was $79,794 in 2011. That income was slightly less – $74,032, for couples with children under 6. However, female-led lone parent families had incomes of approximately one-third that of couple families and male led lone-parent families had incomes that were just over half of couple families with children under 6.